Mickalene Thomas: Mentors, Muses, and Celebrities, installation view, Contemporary Art Museum St. Louis, September 8–December 31, 2017. Photo: Dusty Kessler. CAM presents Mickalene Thomas: Mentors, Muses, and Celebrities, an exhibition of film, video, photography, and installation by the New York-based artist. Thomas recasts and reconfigures notions of beauty, gender, race, and representation in powerful new and recent works. Known for her expressive paintings and collages, Thomas builds upon previous explorations into portraiture to create expanded narratives. In these new works she focuses on black women who inspire, who represent, and who express a wide range of possibilities and desires. Thomas explores and explodes ideas of what it means to be a black woman in the spotlight. Her large-scale, two channel video, Do I Look Like a Lady?, presents a chorus of powerful female icons—including Jackie “Moms” Mabley, Wanda Sykes, Whitney Houston, and Eartha Kitt—their images woven together, reflecting an interplay of power through gender and language. Kitt is an especially important figure as Thomas gives the controversial actress and singer a thoughtful re-consideration as a rebellious, sensual, talented, and compelling force. Likewise, the principal female figures in the 1985 film The Color Purple—Shug, Sofia, and Celie, the latter portrayed by Whoopi Goldberg—are central to Mentors, Muses, and Celebrities. The film deeply affected Thomas when she was a young woman, and in the context of the exhibition the three characters embody qualities of fortitude, power, vulnerability, creativity, and perseverance. 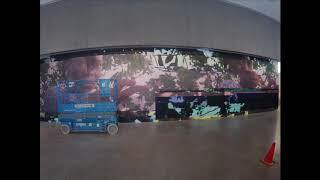 Also relating to The Color Purple, Thomas created a vinyl print consisting of collaged photos and found film footage, a major new work that will cover the entirety of the 60 foot-long Project Wall. Thomas has designed lounges for the main galleries reminiscent of the 1970s period décor of her childhood. These personal recreations of her domestic environment—where such personal mentors as her mother and aunts gathered together—serve as communal spaces where audiences may interact with the artwork and each other. Mickalene Thomas: Mentors, Muses, and Celebrities was organized by the Aspen Art Museum. The exhibition at the Contemporary Art Museum St. Louis was organized by Lisa Melandri, Executive Director. This exhibition is generously supported by Barrett Barrera and Lehmann Maupin, New York and Hong Kong.